On Monday, January 8th the BB team hosted the first annual Bing Bang Bash to celebrate our clients and friends and the work we’ve created together throughout the past year. More importantly, this shindig was organized to focus on what’s to come in 2018 and the exciting projects we have planned together. One of the highlights of the evening was the debut our highly anticipated 2018 Bing Bang Sizzle Reel for all of our clients and friends who make all of this possible. We know we wouldn’t be where we are today without your support, collaboration and in the case of our families – your understanding of our crazy schedules. Thanks for being the reason #WeCreate. A huge shout out to our crack production team: Jeff Felton, Peter Zemansky and Quinton Stanaford for their efforts, and thanks to Dat Dude Biggz for his voice and talents. Now, sit back and enjoy! Want to see your brand in next year’s Bing Bang sizzle reel? 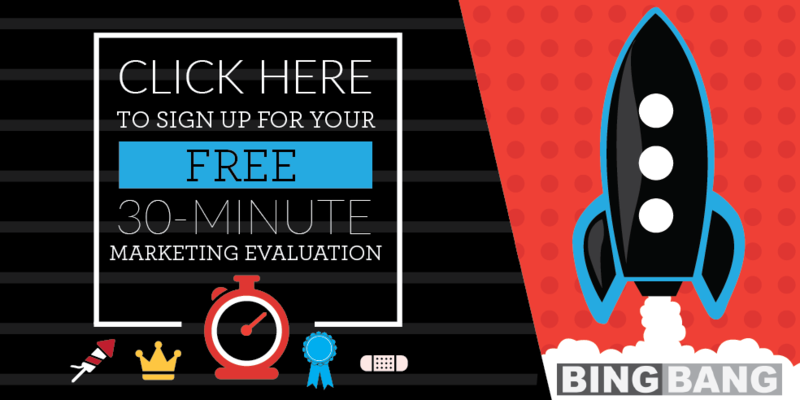 Click here for a FREE 30-minute marketing assessment or fill out the contact form below and someone will be in contact within one business day.